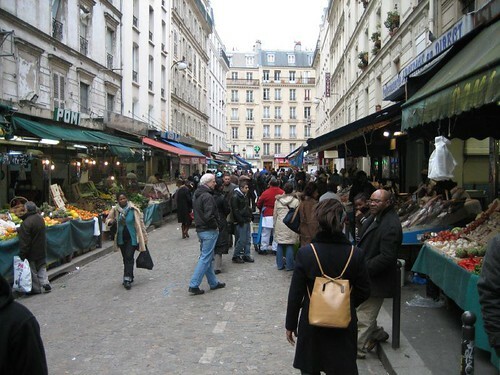 There is nothing we love more than touring cities in search of food and food shops, so we were very excited to see David Lebovitz’ description of a tour down Rue Montorgueil-Les Halles in Paris. It seems like an amazing, concentrated taste of the food culture Paris has to offer (not that there is any shortage of that). Food for thought for anyone planning a Paris trip. We spent a wonderful weekend in Paris last December with our friends T & I, where we determined the best macarons in Paris. Though our international paths are nearly missing each other again, we were lucky enough to see them before we left for Portugal. We were so grateful and surprised when they gave us Macarolats from Michel Cluizel as a going-away present, and it was a wonderful reminder of our time in Paris. So you’re probably thinking, “What on earth is a Macrolat?” It is basically a filled chocolate in the shape of the iconic macaron. The flavors included in our box of 5 Macrolats were: Dark chocolate ganache, Caramel ganache, Coffee ganache, and Crunchy hazelnut praline. All of the flavors were absolutely delicious! Our favorites were the caramel and hazelnut varieties, which were impossibly rich. 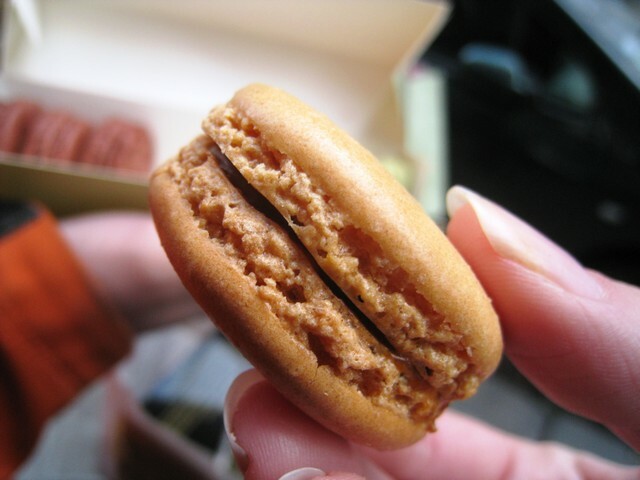 What’s more, Macrolats are more transportable than the delicate Macarons (they made the journey across the Atlantic unscathed) – practical and delicious! 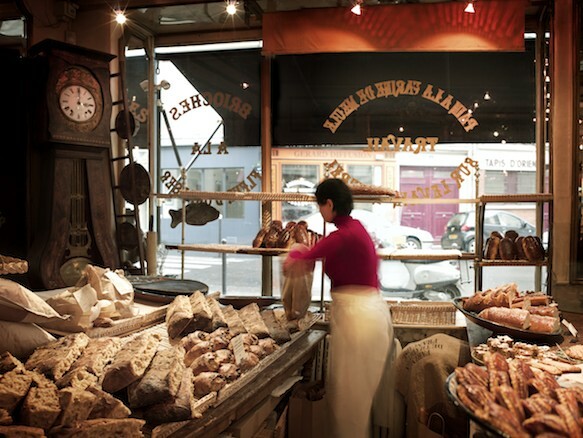 When one thinks of French bread, artistry, tradition and quality probably come to mind. However, we were very surprised to learn that in Post War France, quality bread was hard to come by. Quelle horreur! Afar Magazine has a fascinating article about the fall and rise of bread in France, and how the writer apprentices with one of the current arbiters of the artisanal bread tradition. In 1987 a cultural critic writing in the French newsmagazine Le Nouvel Observateur proclaimed that the baguette had become “horribly disgusting.” It was “bloated, hollow, dead white,” he said. “Soggy or else stiff. Its crusts come off in sheets like diseased skin.” Renowned French baking professor Raymond Calvel mused that the best baguette might soon be made in Tokyo. What had brought this on? And how was quality bread revived in the 1990s? The answers to these questions lay in Paris, which is what brought me to the door of Boulangerie Arnaud Delmontel at three that morning last February. When I learned that Chipotle had arrived in Paris, it seemed that anything was possible in the French capital. 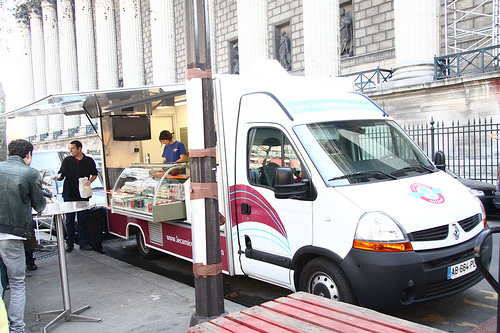 Now, food trucks, one of our favorite food delivery methods, are becoming very popular in Paris, something that is surprising Parisians almost as much as Chipotle. The featured food trucks in the article specialize in gourmet tacos and burgers with fresh and well-sourced ingredients. While living in Lisbon some of things we missed most were good Mexican food and burgers, so we would have definitely visited Cantine California or Le Camion qui Fume! Macarons vs. Cupcakes, Cheese vs. Cheesecake, Patisserie vs. Pastrami. Vahram Muratyan’s Paris vs. NYC blog compares the cuisines, attitudes and styles of each iconic city in colorful graphics. While we were in Paris we saw the book based on the blog for sale, and it is now available stateside! You can buy the book online, along with art prints of the images. It is almost criminal we think, that Tunisian food has so far eluded us. We absolutely love North African food and we can’t get enough of it. However, Tunisian places in Chicago are few and far between, while in Paris they are particularly common (we hear there is a place for Brik in Chicago, though). We were super excited to find a variety of places in Paris to try and made a shortlist – depending on which neighborhood we ended up in. At about lunch time we found ourselves on the left bank neart he Sorbonne– right near Chez Jafaar. Our intrepid Paris hosts I & T were up for almost any kind of food adventure (which is why they are our friends!) so off to Chez Jafaar we went. 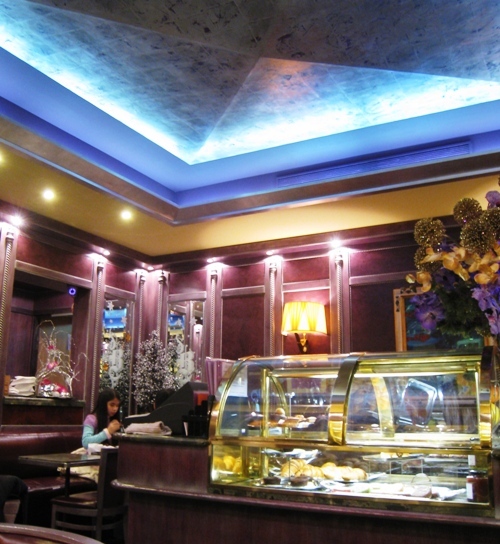 We were also drawn in by the advertised lunch special – an appetizer or dessert and entree for 12 Euros. Other offerings on the menu included tagines and Tunisian specialties like brik and merguez sausage. Both T & L had the lunch special – appetizer of chorba soup, and a serving of chicken couscous (12 euros). The chorba was almost like a thick minestrone filled with celery and pasta shells. Since the weather outside was somewhat frightful, the soup just hit the spot. Since two at the table ordered the couscous it came out family style – with a giant plate of couscous, a giant plate of marinated chicken and a giant bowl of fragrant sauce – with tomato broth, whole carrots and potatoes. M had a lamb and fig tajine, flavored with cinnamon, tumeric, walnuts, and with potatoes. The tajine came out steaming / bubbling hot, and there was a great mix of flavors. The lamb was very well done, tender and fall off the bone, and though the inclusion of the figs was a great taste complement, though he was surprised at how dry they were given how tender everything else in the tajine was. In terms of general impressions, service was a little slow to get going, but our wonderful French-speaking friends, T & I, cleared that up! We were seated, and then over 20 minutes went by before we were thought of again. However, once they remembered us, the service was pretty speedy. Overall, the menu seemed a little on the pricy side when first entering, but we got a staggeringly large amount of food, so our trip to Chez Jafaar was well worth it. Too bad we were unable to take leftovers home…. You know ice cream is good if you crave it even in 40 degree, rainy weather (hmmm, just like Chicago right now). Despite the gross grey drizzle we made a pilgrimage to Berthillon on Île Saint-Louis, fine purveyors of delicious house-made ice creams. Along with L’As du Fallafel, Berthillon is another one of our Paris must-dos – beware though – many places on the same road on the Île advertise that they carry Berthilllon ice cream, but only one is the ORIGINAL Berthillon. As a respite from the cold we opted to go into the small but elegant Berthillon tea room to sample some ice cream (in the Summer there is a walkup counter). 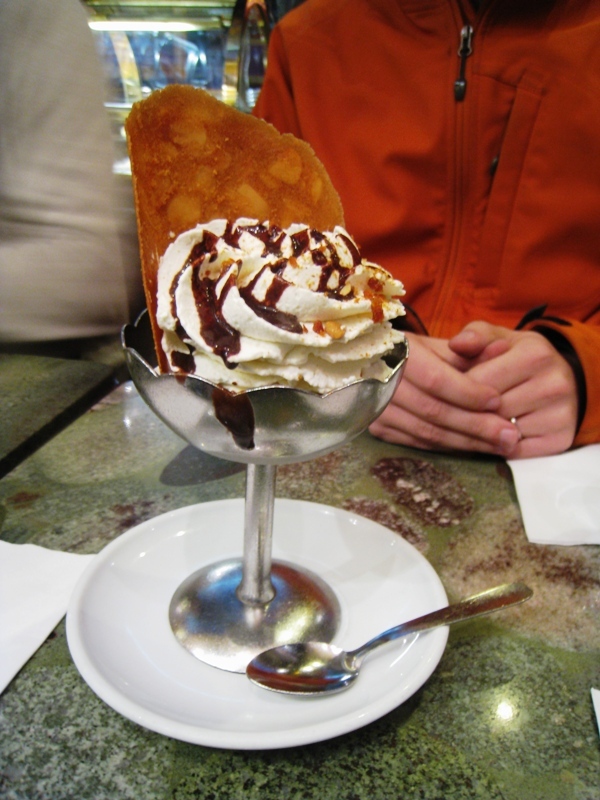 The little tea room serves all of Berthillon’s myriad ice cream flavors – which rotate in and out on a daily basis. The flavor selection at Berthillion is massive – and includes all of the classics, like hazelnut or vanilla, as well as particularly fresh and potent fruit sorbets, there are even a few more unusual flavors like Earl Grey Tea, Turron and Ginger (full list of ice creams and sorbets here – both PDFs). We are partial to the chocolate ice cream and raspberry sorbet flavors, however you can’t go too wrong. Also – as a bonus – they serve Mariage Frères tea – another one of our all-time favorites! While the Eaters opted for a decadent dish of chocolate ice cream covered in chantilly and chocolate sauce along with an almond tuile, our friends went for the salted caramel ice cream. For an accompaniment we got a small pot of Thé à l’Opéra, one of our favorite Mariage Frères varieties, a green tea and red berry blend. For the more adventurous there are also more elaborate sundaes (but those will cost you a lot more). It doesn’t matter the weather – you know you want ice cream! The bright orange sign on this small take-away restaurant makes itself known for blocks. And again, at nearly all hours, it is full of hungry patrons, with Senegalese guitar music blaring through the restaurant (Youssou N’Dour, we think). We were excited to try it for its stellar reviews, but even moreso when we discovered that take-out entrees were only 5E. We both tried the chicken yassa (Yassa Poulet), a traditional west African dish with a mustard and onion sauce. When we arrived right after they opened at 12:30 they were already doing a brisk business (both carry-out and dine-in) though we had to wait about 30 minutes, a tiny amount when compared to the previous night’s adventures at G.J. Restaurant. 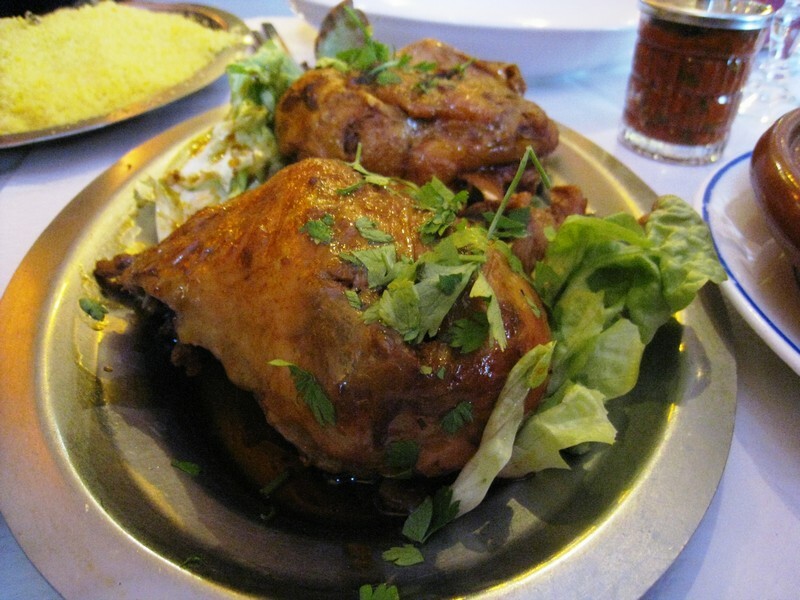 For 5 euros the yassa chicken is an amazing steal – the portions were ample and the sauce was delicious. As far as it goes, we actually probably prefer the Yassa chicken at Yassa in Chicago, but for some cheap and (relatively speedy) Senegalese food in Paris this will fit the bill just fine. In our continuing coverage of holiday-related cakes and desserts (yum!) we move on to France. As much of a fixture as holiday lights and trees, the arrival of the Bûche de Noël cake in pastry shop windows signals Christmas. Known in the US as a Yule Log, the Bûche de Noël consists of rolled sponge cake, typically with chocolate frosting, that resembles a log (even topped with meringue mushrooms). 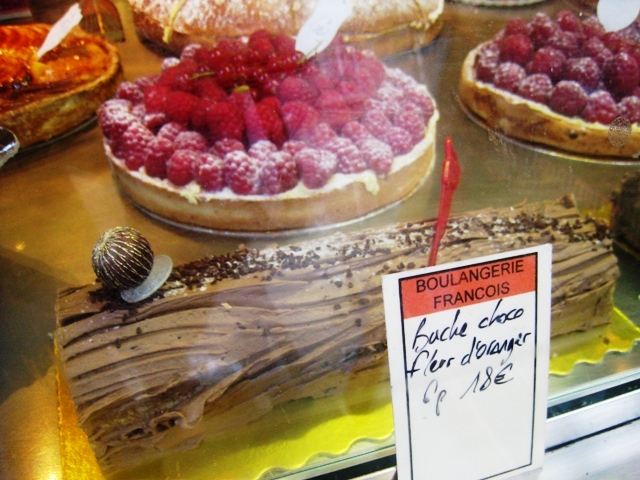 However, the modern varieties available are almost limitless, including this bitter orange-flower flavored Bûche we saw in a shop window. During his reign as Supreme Ruler of the Universe, Napoleon realized there was a lot of disease in Paris. His solution was to mandate that all chimneys must remain closed during the winter months because the cold, drafty air was causing all this inconvenient illness. With chimneys closed, there was no way for the air to get in. Now people were in a pickle. They had no way to burn their traditional Bûche de Noël. So a Parisian baker got creative and invented the cake as a symbolic alternative of the actual piece of wood. For those intrepid bakers, Saveur has a traditional recipe and Canelle et Vanille has an amazing looking version with lemon creme brulee filling and dark chocolate glaze. According to Serious Eats, Floriole in Chicago has a pretty awesome Bûche de Noël. One of the few repeat destinations we visited on this small trip to Paris was L’As du Fallafel. We remember being impressed with the falafel four years ago, so we were excited when our friends that lived in Paris suggested we visit there again. As you might guess, the specialties at L’As du Fallafel are falafel, shewarma and the like. Approaching the restaurant you know it must be good, because even at an odd time like 3 PM – it was completely full, with a line for both take-out and restaurant service. One famous celebrity fan is Lenny Kravitz – a fact of which the owners are very proud – and there are photos and quotes of Lenny Kravitz plastered over nearly every wall and also on the outside of the restaurant. You can see evidence of the popularity below, a huge line to get in, even at 3PM (note also the Wikipedia article). However, the line is not for nothing, L’As really delivers. The specific type of falafel at L’As is Israeli, which happens to be one of our favorite types, and one we have tried extensively on all of our travels and back in Chicago. Each falafel sandwich (€7.50) came with grilled eggplant (delicious), cabbage, tomatoes, cucumbers, and was doused in tahini sauce. As you can see below – this was no paltry sandwich. Though we had to wait for over ½ hour to simply sit in the restaurant – our food came out lightening-quick. 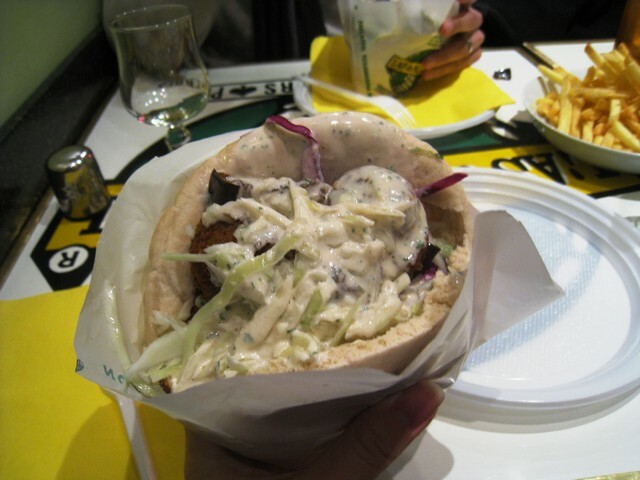 The falafel were fresh and perfectly spiced, and arrived piping hot. We can’t imagine how many falafel they turn out in a week – at least several thousand, we’d bet. The crispy fries were nothing to scoff at either and the chicken shewarma (€9.50) was freshly carved off of the spit. We think perhaps that L’As du Falafel has grown in popularity since we were there last- we do not remember nearly as big of a crowd – maybe it is all of the Lenny Kravitz fans swamping the place? If you are craving some good, relatively cheap falafel in Paris, this place is certainly your best bet. 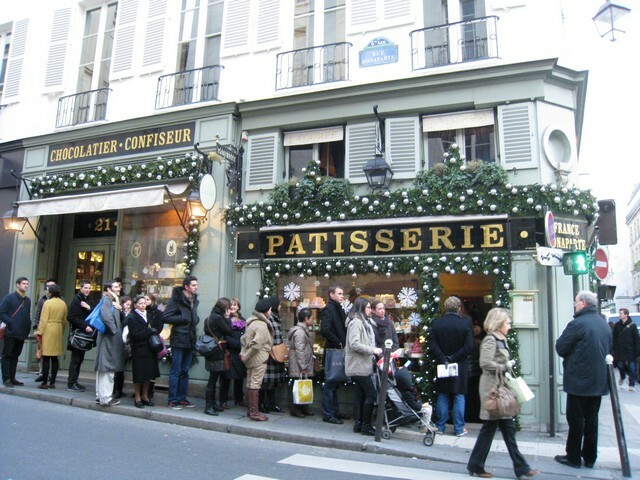 Both stores had lines out the door (and were located mere blocks from eachother in the Saint Germain des Prés neighborhood). However, Ladurée gets the hat-tip for having lower prices for roughly the same sized macarons. At Pierre Hermé eight macarons were €15.70, Ladurée came in at €12.10. Verdict: Ladurée – we are poor grad students, what do you expect? We got yelled at in each store for taking pictures – but only after about 20 photos. Oops…? In terms of decor, the two shops could not be more different. Ladurée is a pastel-colored confection, full of filigree and antique fixtures. Pierre Hermé, on the other hand, is extremely stark and sleek, and really goes for the minimalist look. 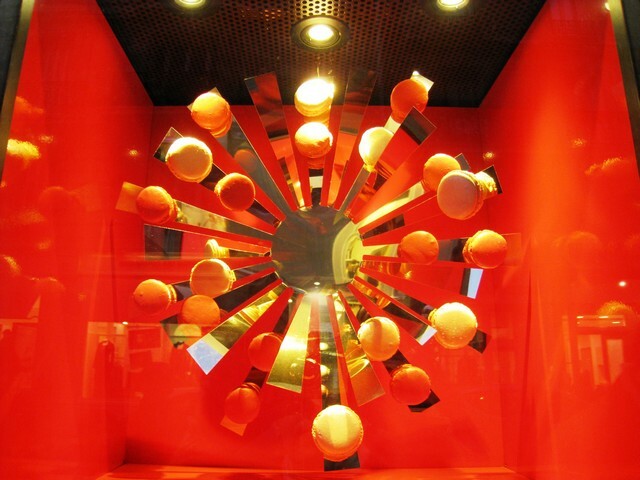 This style was also reflected in each store’s Christmas window decorations, as seen below. Verdict: We slightly preferred Ladurée, for its old-world charm. 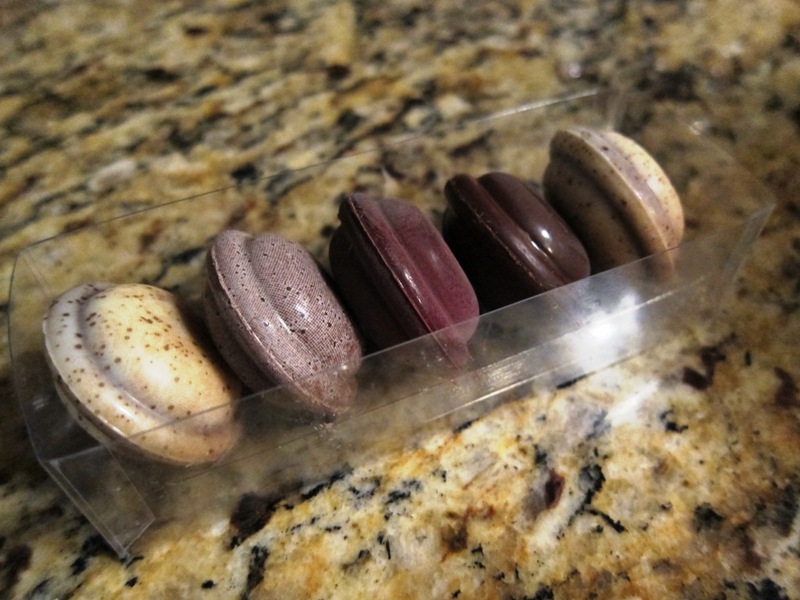 Pierre Hermé provided little menus with all of the macaron flavors so you could decide while waiting in line. However, Pierre Hermé was also out of a flavor – one that might have been our favorite flavor! Overall, Pierre Hermé was more inventive, and had flavors like Olive Oil/Citrus and Chocolate/Foie Gras, whereas Ladurée only had more classic flavors. In terms of flavors, it was decided that at both locations, the salted caramel and chocolate were the best, so we will discuss those below. Both of the restaurants featured a single-original dark chocolate South American macaron, with chocolate cookies and dark chocolate mousse filling, dusted with cocoa powder. 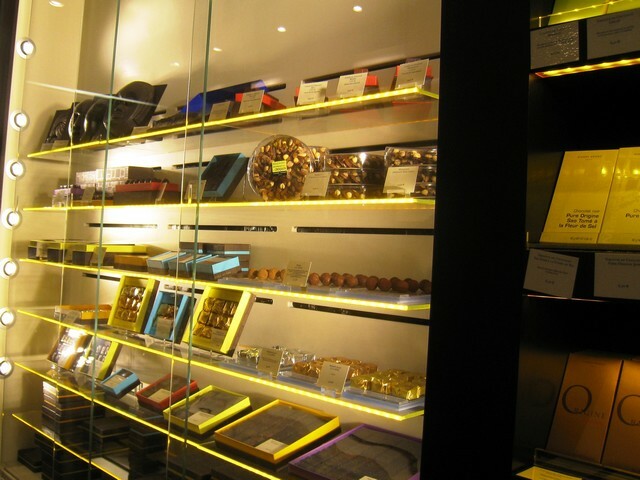 Verdict: Split Decision – One of our testers preferred the Pierre Hermé, and two preferred Ladurée. Salted caramel is such a delicious and unexpected flavor – and is one that lends itself very well to macarons! All 4 testers ranked salted caramel as the top flavor at both stores. While each was delicious. the key difference was between the fillings – Ladurée had a filling of actual milk caramel, while Pierre Hermé was filled with a salted caramel-flavored buttercream. Verdict: Ladurée – the actual caramel made all of the difference. You can’t really go wrong with either choice. But we do have a winner. Overall, considering price, decor and overall taste, Ladurée was the champion. We can’t wait to go back! 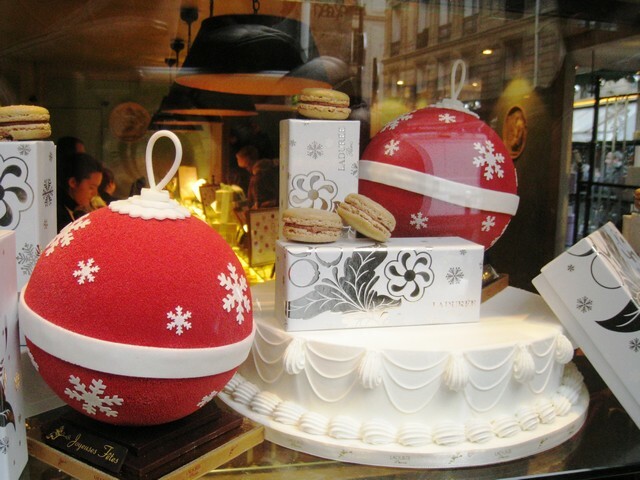 Heading to Paris for a long weekend – excited for the macarons, tagines, cheese, falafel and Christmas market delicacies! This is our first time in Paris since 2007 – which is where we got the inspiration to start Eating the World at a Senegalese restaurant. We are staying with good friends in the 18th Arrondissement, which is a mecca for African food, so we are especially excited to try out some new dishes and hit some new countries (Like Tunisia, Benin and Togo). One weekend does not seem like nearly enough time, but we are so excited and grateful to get back to where it all began! 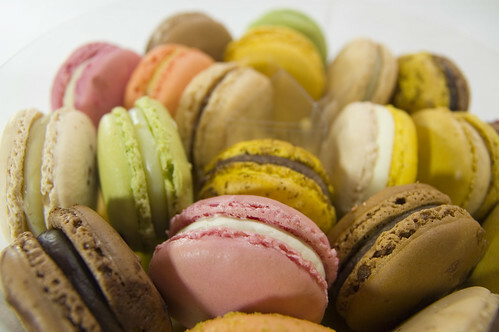 Macarons, with their near-infinite variety of colors and flavors, are the most Parisian of desserts. The Kitchn does a pastry tour of Paris and determines that the winner of the best Macaron title is…. 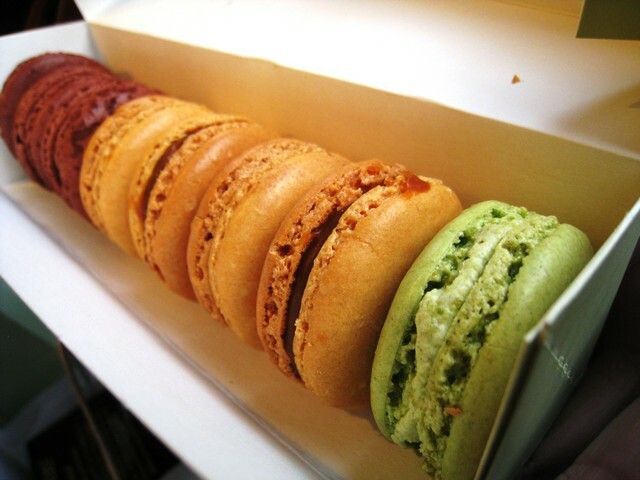 Flickr Credit: Yuichi.sakuraba’s macarons from Pierre Hermé, Tokyo. It’s funny to imagine that a Wisconsin cheddar is a pricey luxury import abroad. But, according to the Wall Street Journal, this is increasingly the case, as American artisanal cheeses are making their way to Europe. This is a trend I approve of – hopefully it will change some attitudes that American Cheese = Velveeta. Eating the World started as an idea in a Senegalese restaurant in Paris, and with a glimmer of a trip to France next year on the horizon, we are already in pre-pre-planning mode. So in prep for that we have compiled some links that may prove helpful. African restaurants in Paris tend to be Northern and Western Africa – corresponding with the francophone regions of the continent. A large hub of the African population is the Goutte d’Or (Drop of Gold), located in the 18th arrondissement, along with Montmartre. For the flâneurs among us, we found an interesting self-guided walking tour of the Goutte d’Or on the Anglophone Parisian Site Parisvoice. First up foodwise, a comprehensive article from the New York Times extolling the charms of Paris’ African eats, ranging from trendy nightclubs to little patisseries. 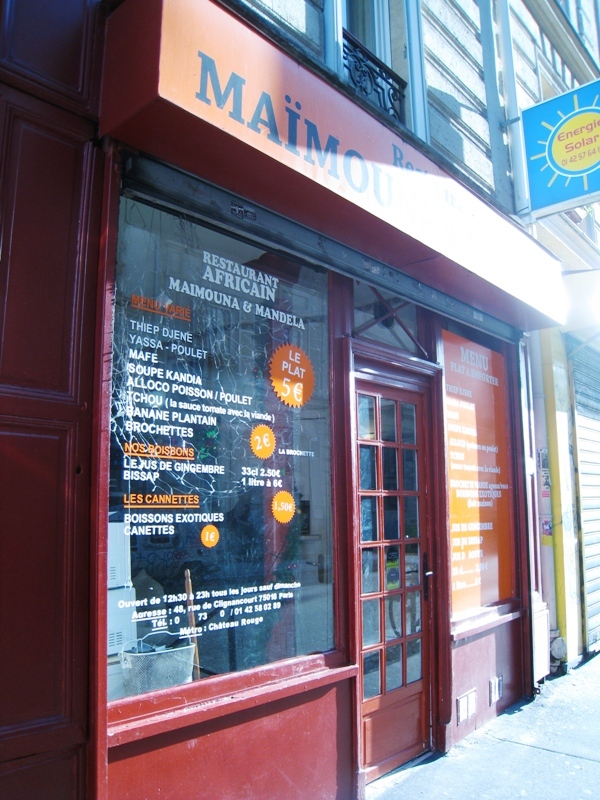 We are especially drawn to Algerian bakery La Bague de Kenza, (106, rue St.-Maur). However, befitting the more well-heeled NYT reader, the article covers more high priced eats. More our speed are hole-in-the-wall cafes selling the Tunisian egg and pastry specialty, Brik. 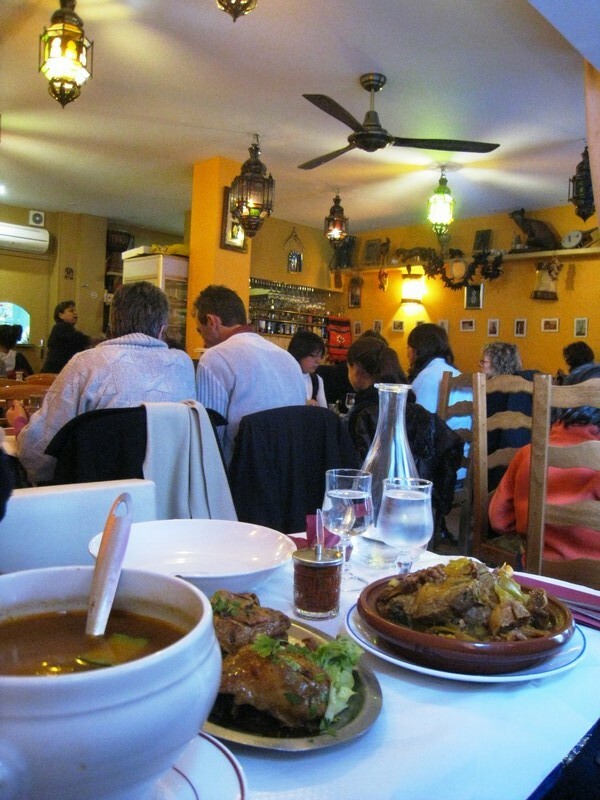 At this the lower end of the price scale (less than 15 euros), Chowhound users weigh in with some recommendations: North African restaurants in Paris and Ethnic restaurants in Paris?. If you read French, we also found an interesting review site where you can search by cuisine, called Linternaute. It’s very comprehensive, and they even have a category for Réunionnais restaurants. Guess there aren’t many expatriates from Réunion in the US…. Though North African restaurants may be more numerous, other areas of Africa are represented. 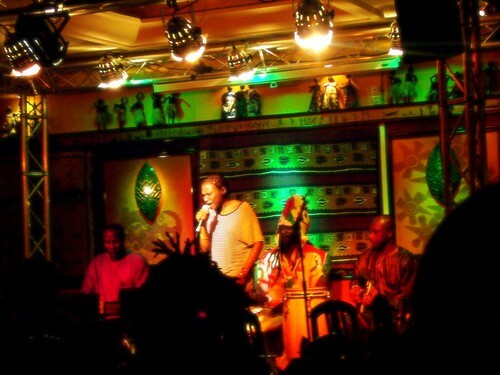 In the photo above, Kaysha, a French rapper of Congolese heritage, performs at Moussa, a restaurant specializing in West African cuisine (25-27, avenue Corentin Cariou). All of these wonderful recommendations are making us eager for our trip, even though it is a year away. Perhaps next week we will branch out to other esoteric cuisines found in Paris – Guadeloupan? Maltese? Corsican?